The Florida eviction notice forms are used in the event that a tenant is failing to abide by the terms of his or her lease by either failing to pay rent when it is due or breaching some other provision in the contract and the landlord is seeking to have the breach corrected or have the tenant move out. The landlord must provide notice to the tenant depending on what type of breach is occurring and if the tenant does not respond, landlord can begin to take steps to have the tenant evicted through the court system by filing a complaint and summons in the County Court in which the property is located. 3-Day Notice to Quit (Non-Payment of Rent) – This form of notice is used when a tenant has failed to pay rent when it is due under the terms of the lease. The landlord may send this notice and the tenant has three days to respond by either paying the rent or moving out of the premises. 7-Day Notice to Quit (Non-Compliance) – This form of notice is used when a tenant has failed to abide by other aspects of the lease other than non-payment of rent. 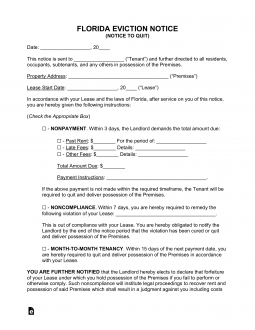 The landlord may deliver this form requesting that tenant correct the problem or vacate within seven days. 15-Day Notice to Quit (Month to Month) – This form is used to inform a tenant that a month-to-month lease will not be renewed and that he or she is required to move out at the end of fifteen days. Rent is late when it has not been by the date specified in the lease. If rent is late, the landlord may send a 3-Day Notice to Quit (Non-Payment of Rent) asking for payment. If payment is not received within the three day period, the landlord may institute court proceedings to evict. Step 1 – Before any court proceedings to evict can proceed, a landlord must provide the tenant with written notice. In cases of breach for nonpayment of rent, the landlord may use the 3-Day Notice to Quit (Non-Payment of Rent). If the breach is due to other breaches, the landlord may use the 7-Day Notice to Quit (Non-Compliance). If the landlord is seeking to terminate a lease, the landlord should use this 15-Day Notice to Quit (Month to Month). Step 2- If the tenant fails to respond to the written notice in the time period allowed, the landlord may begin eviction proceedings by filing a complaint and summons with the County Court in which the property is located. There are different complaints depending on the situation. Complaint for Eviction and Damages – This complaint is used when the landlord seeks to obtain damages, such as back, rent, cleaning costs, repair costs, etc. in addition to having the tenant evicted. Complaint for Eviction re-Breach – This complaint is for use when the landlord is just seeking to evict for a breach other than nonpayment of rent, and not seeking damages. Complaint for Eviction – The landlord may use this form when seeking to have a tenant evicted for non-payment of rent, but not seeking damages. Landlord will have to provide 4 copies of the notice sent the tenant. In addition, the landlord will have to pay a filing fee of $85. The court will serve the tenant with the summons. The Florida Notice to Quit may be downloaded using the “PDF,” “ODT,” or “Word” buttons. This form will act as a Notice to Quit once it has been filled out. You will also need to make sure any information listed on the Lease must be reported precisely as it is presented on the Lease thus, make sure you have a copy of the Lease available for consultation. Fill in the Name of the offending Tenant or Subtenant as it appears on the Lease. This will be the individual this Notice is addressed to. The next two statements will each seek to define facts regarding the Rental Agreement. This section will require that all the information reported be identical to the way it is presented in the Lease. You will need to report the location of the Rental Property by entering its individual components separately across several blank spaces: City, County, Zip Code, Building Number/Street, and Apartment Number. Similarly, the second statement will require the individual components of the Signature Date reported on Lease to be entered across three spaces: Calendar Date, Month, Year. The Terms of this Notice must now be defined. That is, the purpose for filling out and delivering this form (appropriately). There are four available options to choose from to list as the purpose of this document, you may only choose one. Select the first check box if the Tenant owes a Past Due Amount that must be collected. Here the Tenant will be given a choice of surrendering the property in three days or paying the Overdue Rent. There will be several pieces of information that must be filled in for such cases. First, report the Name of an Authorized Agent who may accept the Tenant’s payment in addition to the undersigned. Then the Dollar Amount owed must be documented with the Rental Period requiring payment. Select the second check box if the Tenant has violated a Lease Term (i.e. property damage, breaking building rules, etc.) and will have seven days to either correct the violation to the satisfaction of the Landlord or surrender the premises to the Landlord. In this case, report the Lease Term or Terms that have been violated by the Tenant on the available blank line. Select the third check box if the Tenant is simply in a Month to Month Lease and must be given Notice the agreement will end. This will require the exact Date the Month to Month Agreement ends to be reported on the spaces available. Note: The Termination Date named must be at least 15 days after the next payment date. Select the fourth check box if the Tenant is issuing Notice to a Landlord regarding a Month to Month Tenancy that must be ended. The Date of the Month to Month’s termination must be reported and must be at least fifteen days from the next Rental Payment Due Date. The issuing party (Landlord or Landlord Agent) should read the paragraph beginning with the words “You are further notified…” then, Sign his or her Name on the Signature Line below it. This Notice must be delivered reliably to the recipient allowing for the appropriate amount of Time to pass from its receipt to the Date of its effect. The Deliverer of this document will need to provide the exact Date delivery was successful as well as the Name of the person it was delivered to, in the statement beginning with the words “I certify that…” The method of Delivery will be defined by one of the checkboxes below. If the recipient was the party who received this document, the first checkbox will be marked. If a reliable second party received this document on behalf of the recipient, the second checkbox will be marked. If this document was sent via First Class Mail, the third box will be marked. The Signature of the Delivery Agent must appear on the last line of this document.